Vvardenfell, also called the Black Isle, is a large island located inside the bay-like Inner Sea, and is surrounded by mainland Morrowind with the exception of its northern coast, which meets the Sea of Ghosts. The island is dominated by the great volcano, Red Mountain. 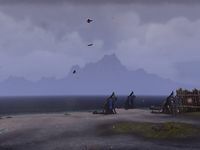 The island itself is named after the original Dwemeri name of Red Mountain, literally translating to "City of the Strong Shield". It is characterized by arid wastes, rocky highlands and coastal wetlands filled with unusual and unique flora and fauna. Red Mountain’s lava flows, eruptions, and ash-fall cause Vvardenfell’s landscape to undergo a constant cycle of death and rebirth. The soil becomes greatly fertilized thanks to the volcanic activity, and new plants and fungi emerge from the cooling ashes. It also causes the island to expand as the lava hardens. The corruption of Dagoth Ur’s Ash Blight would have a dramatic effect on the environment and its inhabitants. 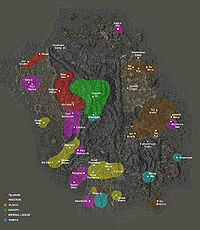 By the late Third Era, Vvardenfell was noticeably less vibrant, and Cliff Striders, Nix-Oxen, and Vvardvarks were wiped out. 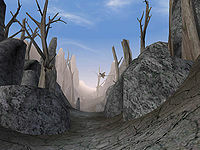 During the Red Year of 4E 5, Vvardenfell was devastated after the Ministry of Truth crashed into the city of Vivec, causing Red Mountain to erupt. Most of the island was covered in ash, forcing much of the population to evacuate. This page was last modified on 30 March 2019, at 16:50.